Here's what's going on in my kitchen; I have been having a slight aversion to cooking. I think it's because I had to leave the dream kitchen in my friend Shannon's house and return to my tuna can sized one. I would like to have a stove that I didn't have to monitor the temperature in all the time, and a prep area bigger than my cutting board. But alas, I will have to make do. So to get me out of my slump, I decided to challenge myself to a baking extravaganza; 12 cookie recipes by Dec 20th! It is going to be tough, but I think I can pull it off. I have been polling my friends, coworkers and facebook followers to find out what their favorite holiday cookies are, paleo or not. 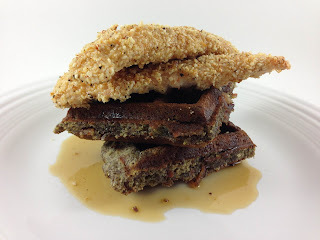 I am then going to attempt to make a paleo version in the next 3 weeks. I wish it was as easy as substituting almond flour for white flour, honey for sugar, etc., but baking is a science, and changing any ingredients, changes the recipe completely. So I will have to come up with creative ways to mimic the taste and texture of the standard holiday cookie to fit into my paleo parameters. I have purchased a few new ingredients as well, hoping they will help with said mimicry, palm shortening and coconut palm sugar. I also made "powdered sugar" out of the coconut palm sugar for a flourless cookie I am going to try. Sugar Cookie Cut-outs - my grandmothers recipe calls for sour cream, we'll see about that! Magic Bars - Graham cracker crust here I come! Wedding Cookies - my powdered palm sugar will come in handy here. 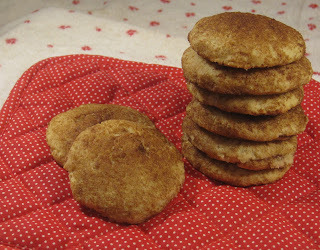 Snickerdoodle - favorite childhood cookie. Flourless Chocolate Walnut Cookie - part meringue, part chewy goodness. Cranberry Crumble Bars - I haven't quite worked this one out yet. Pumpkin Spice Macaroons - adding the vegetable of the season seemed appropriate. Meringue Cookies - my mother in laws recipe from Ian's childhood in Saudi Arabia. Thumbprints - my grandmothers recipe! Rum Raisin Spice - who doesn't like a little alcohol this time of year? Chocolate Cherry Bars - another of Ian's favorite child hood recipes. Peanut Butter Blossoms - my favorite cookie of all time, peanut butter cookie and a Hershey kiss! This is a pretty intimidating list if you ask me. I will be updating my daily progress and posting the recipes as they work themselves out. Happy Holidays!